Our Orvieto Day Tour will begin with a journey from Rome into the heart of the breathtaking countryside of Umbria to Orvieto in the comfort of your own private deluxe vehicle driven by your personal Rome Cabs knowledgeable English speaking Driver eager to help you create memories you’ll cherish for life! From your Rome hotel or accommodation: Your Driver will pick you up at 8:00 AM and bring you back at approximately 5:00 PM. We will begin our journey with a scenic two-hour drive to Orvieto, a medieval marvel perched high atop the majestic La Ruppe (The Rock). Orvieto is situated above a volcanic plug, which is a volcanic landform created when magma hardens within a vent on an active volcano. 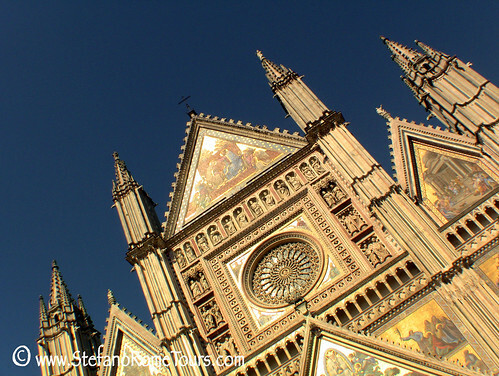 Upon arrival, we will visit the stunning Cathedral in Orvieto, which was built in the fourteenth century. Pope Urban IV ordered the construction of the cathedral to provide a beautiful, holy place for the Corporal of Bolsena. The Corporal of Bolsena was a miracle that is said to have occurred in the town of Bolsena in 1263. The Corporal is the small cloth upon which the host and the chalice are placed during the Roman Catholic Eucharist. It was believed that this particular Corporal had drops of blood on it, thus substantiating the Roman Catholic belief that the bread and wine used in the observation of the Eucharist become the literal body and blood of Christ. The Corporal is still held in a reliquary in the center of the cathedral and brought out for various religious observances. The cathedral’s construction was begun in 1290 and lasted for almost 300 years. During the course of that time, the design evolved from Romanesque to Gothic. Many significant works of art can be found in the cathedral, and a visit to the Chapel of the Madonna di San Brizio is a must-see. It contains frescoes begun by the famous artist Fra Angelico and finished by the equally outstanding Signorelli. The frescoes represent many events in Christianity including the Apocalypse, the Last Judgment. They begin with the Preaching of the Antichrist and continue to the Doomsday and the Resurrection of the Flesh. The cathedral’s façade contains many of the elements of design that were common to religious construction from the 14th to the 20th century. One extremely stunning aspect about the facade is that when the sun light hits it just right, it glows and shimmers ablaze. After visiting the cathedral, if you wish you will have the opportunity to visit the Pozzo di San Patrizio (the well of St. Patrice). Orvieto’s main military weakness was a lack of water, so the Medici Pope Clement VII ordered the well to be dug in case of a military siege. Visitors can walk down the 248 steps to the bottom, although the only thing to see is the water at the bottom of the well. Orvieto has several excellent restaurants where you will enjoy your lunch, and then you may want to take the opportunity to sample the local wine only available in Orvieto. The excellent wines are mainly white wines made from a blend of mostly Grechetto and Trebbiano. The region has been producing wine since the middle ages, and today’s white Orvieto is dry, but a semi-sweet style, known as Orvieto Abboccato, and dolce (sweet), are also produced in small quantities. Orvieto’s spacious streets are perfect for strolling and shopping, especially at the many gourmet markets and shops where local artisans showcase traditional hand crafted ceramics, whimsical wooden objects and unique sculptures, lace works, and jewelry of exceptional beauty. At the edge of town, you have a perfect vantage point of the alluring Umbrian countryside that surrounds you. After enjoying the best Orvieto has to offer, a leisurely drive back to Rome will offer you another opportunity to admire the majestic countryside of Umbria and Lazio. Thank you for touring with Rome Cabs Limousine Car Service. We are here to help make your next visit to Italy your trip of a lifetime! Guests who booked this Orvieto Tour also enjoyed “Assisi” Tour in Umbria, “Montepulciano and Pienza” ~ Wine and Cheese Tasting Tour in Tuscany, and the “Splendor of Ciociaria” ~ An Italian Countryside Experience via our sister company Stefano Rome Tours. Please read the following information and Terms of Service prior to booking this tour. * Tour price includes a professional English speaking Driver with a private deluxe vehicle, Italy’s VAT tax, fuel cost, insurance, applicable toll and parking fees. * This tour does not include entrance fees to any sites, lunch, wine tasting, gratuities, or other client personal expenses. * Your Tour Driver: This tour provides an English speaking Driver who is not a licensed tour guide. Italy laws permit only licensed tour guides to accompany guests into squares, churches, museums, or other tourist attractions. In order to be in compliance with Italian laws, your driver will provide basic information only while inside the vehicle and will remain with the vehicle while you are sightseeing. * If you are pleased with the service you received from your Driver, a minimum of 10% gratuity is customary in Italy. * Modes of Payment: Payment for the tour will be made in Euro funds to your Driver at the end of your journey. If you wish to prepay in advance, you may do so via PayPal. Please let us know when you book the tour that you wish to prepay via PayPal. We do not accept credit card payments. * Please allow up to 24 hours for all email inquiry replies and service confirmations. We have limited office hours on Sundays, please allow additional time. CANCELLATION POLICY: Don’t worry, we do not ask for your personal credit card information, require advance deposits to reserve your tour, or penalize you for cancellations. We operate on the Honor System, so we kindly ask that cancellations be made at the minimum 7 days in advance so we can rebook your service and your reserved driver does not lose work for that day. We thank you for your cooperation and consideration. Before booking any services via this website, you must first read and accept our Terms of Service. * Please wear comfortable shoes and clothing.